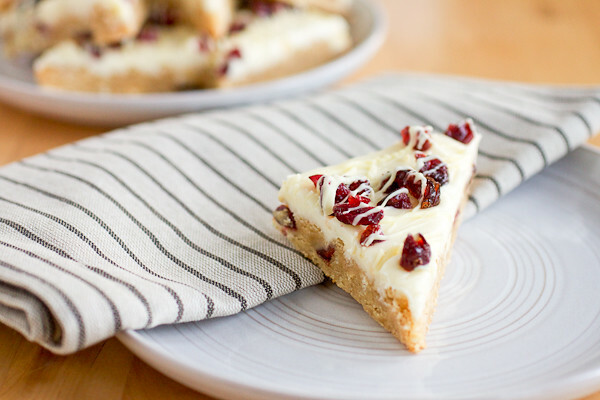 Homemade Cranberry Bliss Bars: You’ll never believe how easy it is to make this Starbucks holiday bar copycat recipe at home! They’re SO MUCH better than what you can buy! I think my parents thought I was crazy when I was looking at colleges. My “fall-back” was a small state school in upstate NY. And by upstate, I mean way-the-hell-upstate, not just a little north of NYC, as many downstaters see the Hudson Valley. Potsdam is north enough in New York that you could almost throw a stone over the Canadian border. It was an 8 ½ drive to see the school. In March. Where it still snowed like a mutha. My first choice, however, was an even smaller lush private school in PA where snow was “meh.” I had butterflies when I visited. I’m positive my parents had nightmares about the cost. You’ve heard this story before. You know what happens. That following August, this south-shore-downstater packed her Bean Boots, silk long underwear (a much better base layer than traditional waffle-weave long-johns, FTR), heaviest winter clothes (who knew what November would bring even before Thanksgiving was in sight?) and half of her childhood bedroom – mom would say three quarters – and headed north to her new home away from home. Included in the massive amount of winter clothing that filled my tiny dorm closet to the brim that August were a few pair of flannel lined jeans. On the mornings where the average low temperature in January was nearly 0 degrees F, these jeans came in handy. And sometimes, the long underwear went underneath the flannel lined jeans. It was freaking COLD. But those jeans saved me that year – they were like a warm hug on a cold morning. 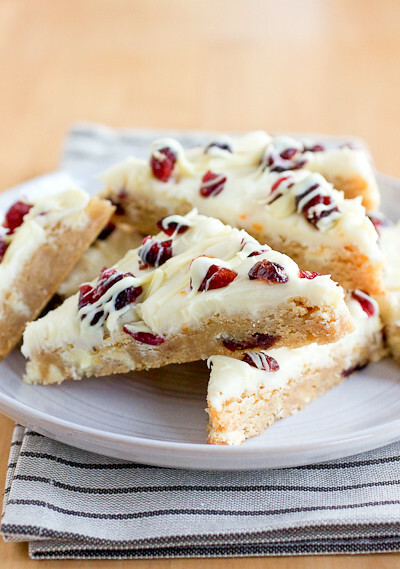 These cranberry bliss bars are similar. They’ll wrap you up and warm your soul. If you’ve been to Starbucks this time of year, you know the treats I’m talking about. And surprise, surprise! This copycat version of those Starbucks holiday bars is SUPER easy to make at home! 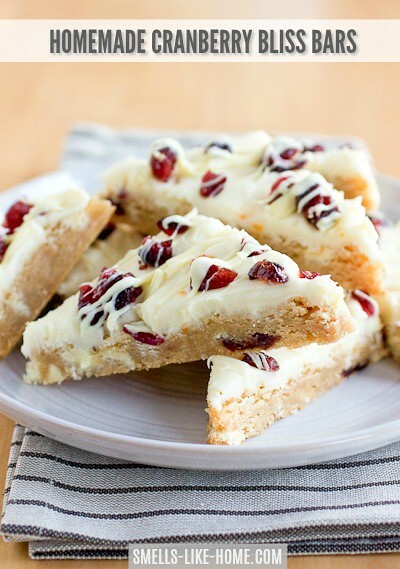 With a white chocolate, cranberry, and brown sugar blondie base, a lightly-flavored orange cream cheese frosting, and more cranberries and white chocolate drizzled on top, how could you possibly go wrong? The wee bit of ground cloves in the blondies pulls the orange and cranberries together beautifully and adds to the general addictiveness of these holiday cranberry blondies. Those mushy-base Starbucks holiday bars that you have to eat with a fork are no comparison to these homemade treats. 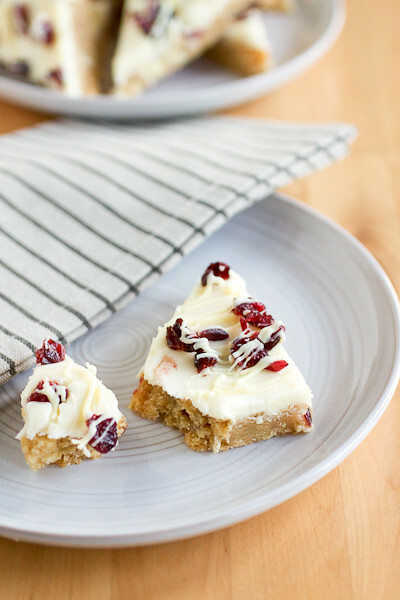 These homemade cranberry bliss bars from Recipe Girl are downright delicious – and you don’t need a fork to eat them! Perhaps paired with a mug of warm spiced wine or cider, these bars are perfect for a cold winter night. Flannel-lined jeans are optional, of course. Preheat oven to 350° F. Grease a 9×11-inch baking pan with cooking spray or butter. Whisk the flour, baking powder, salt, cinnamon, and cloves together in a medium bowl; set aside. To make the blondies: Melt the butter and stir in all of the sugar until the butter has completely incorporated; let the mixture cool to room temperature. Pour the mixture into the bowl of a stand mixer fitted with the paddle attachment. Beat in the eggs and vanilla on medium speed until the eggs have incorporated. With the mixer on low, gradually stir in the dry ingredients until no evidence of flour remains. The batter will be very thick. Stir in the cranberries and white chocolate until they are dispersed. Dump the batter to the prepared baking pan and with your hands, flatten it out (without mashing it) into the pan. Baked for 18 to 20 minutes until the edges are just barely golden brown (mine took exactly 18 minutes). Let the pan cool on a wire rack until the blondies are completely cool. To make the frosting: Beat the cream cheese and powdered sugar together on medium speed in the bowl of a stand mixer fitted with the paddle attachment until combined, about 30 seconds. Quickly mix in the orange zest. To assemble the bars: Remove the uncut blondies from the pan and place the whole piece on a large cutting board. Spread the frosting evenly over the blondies (an offset spatula works great here) right out to the edges. Sprinkle the cranberries over the frosting. Drizzle the white chocolate over the cranberries and frosting – don’t worry about being too neat in your drizzling here. Transfer the blondies on the board to the refrigerator to allow the frosting to set up for 30 minutes. Cut the blondies lengthwise into thirds then cut each third into four squares. Cut each square diagonally in half into triangles. You can cut the triangles in half again if you want/need more bars. These bars can be kept at room temperature for a couple of days but they last better in the refrigerator in a tightly sealed container. Serve right from the refrigerator or slightly warmed to room temperature. You bring back all my memories of growing up on the coast of Maine, and those flannel-lined jeans from Beans. And the snowshoes. And long underwear. And cross-skiing. I’ll stop now. The memory brings on such a nice ache. Your recipe is on my to- be-baked-soon list. I loved your cold weather tale. I also went north for college, from Long Island to SUNY Plattsburgh and almost panicked when my nose froze shut the first time. Who knew! I live 30 miles from Potsdam and we have freezing rain/sleet today. It’s the perfect excuse to stay inside and make these amazing bars! Aww love you too Aunt Marie!! I’m thinking about making these for Christmas. Do you think they’d freeze well? In my experience, cream cheese doesn’t freeze well but the blondies on their own will freeze great. I would suggest baking them and then wrapping up the entire slab of uncut blondies to freeze. When you’re ready to use them, thaw the slab in the fridge overnight and make the frosting fresh to spread over before cutting them. Enjoy!